Support for a second EU referendum is at all time-high. Polling finds surge in support for another vote before Brexit. Public is deeply divided with large numbers of voter still persuadable. Polling comes as growing numbers of public figures call for Brexit to be averted. 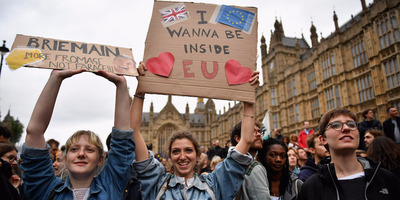 LONDON — Support for holding a second Brexit referendum has surged to its highest point since the vote to leave the European Union last year. As David Davis returns to Brussels on Monday to restart Brexit negotiations, new polling by Opinium finds that support for another vote is continuing to rise. 41% of the British public now support holding another referendum, up from 31% at the end of last year, with 48% still opposed. Separate recent polling on whether there should be a vote on whether to accept the final Brexit deal with the EU finds a majority supports a second vote. A poll by Survation found that 53% of people would back a second referendum on whether to accept the terms of the final Brexit deal, with 47% opposed. Today’s Opinium polling finds a deep divide on the question of whether Britain should go back to the polls. Among Remain voters, support for another poll is at 69%, while among Leave voters, opposition is at 82%. However, while two-thirds of voters say they feel “very strongly” about whether Britain leaves the EU not, around a third of voters are less committed, suggesting there is room for overall public opinion on Brexit to switch before March 2019. Opinium: Which of the following statements best describes your view on Brexit? The findings come as a growing number of senior politicians and public figures speak out about the possibility that Brexit may still be averted. With the EU chief negotiator Michel Barnier warning last week that the “clock is ticking” for Britain to negotiate a deal before exiting, former Business Secretary and likely next Liberal Democrat leader, Vince Cable, told Business Insider that he now believes Brexit may in fact not happen. “It’s certainly a possibility. It’s not yet a probability,” he said. “I think public opinion on [Brexit] is moving,” he told Sky News at the weekend. Business groups are also calling for an extended transition period with the EU, meaning that Britain could continue to accept free movement of people and the jurisdiction of European courts for years to come.